Another irrational fear is the gaping holes under my floor vents. One of the joys of an old house is the giant (one square foot or even larger!) vents on floors throughout the house. The cat loves them – especially in winter – and will puff herself up and stretch out to cover absorb as much of the air as possible. But I’m always afraid of the gaping canyon beneath the pretty, heavy iron grate coverings, especially in the upstairs bathroom. 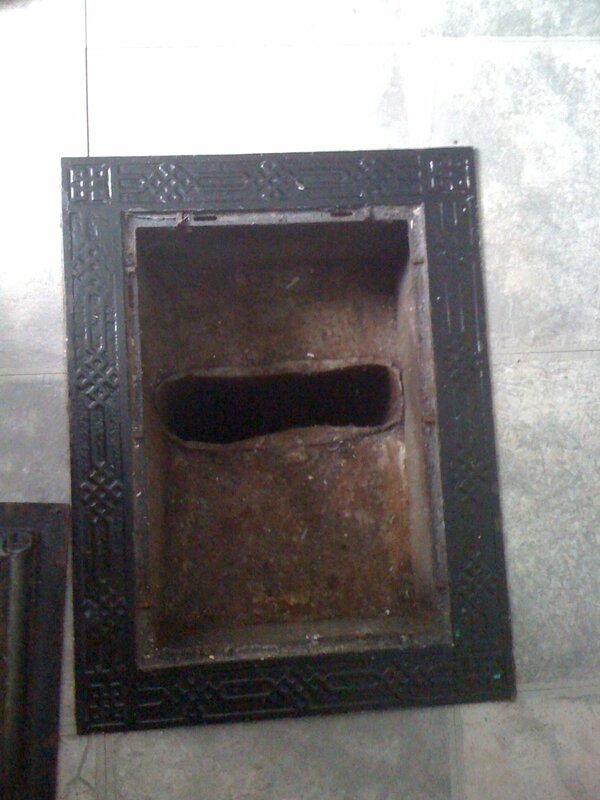 Last weekend, while vacuuming out the vents (a twice yearly chore), I had my usual qualms about what lies beneath. I’m assuming it goes straight down two stories to the furnace in the basement, with nothing to stop the freefall. I’ve dropped the occasional thing into the hole – an aspirin, a q-tip – but what if I dropped something important? Could I ever get it back? Has a previous resident ever dropped something? With a deathgrip on my phone, I took a picture of the abyss. Do they make a wrist strap for cell phones? Either way, I’m glad I cleaned out all the dust (and accumulated cat fur) – and I’m breathing easier. I have a relatively active imagination, so I’ve spent every night for the past week wondering why there are now snakes living in my toilet tank. At least, that’s what it sounds like. And what goes through my mind as I’m showering. Or trying to fall asleep. The hissing started about a week ago, right after the city installed our new water meter. I’ve lifted the lid and there’s no signs of leaking or continuously running water. Everything works fine. It just hisses, constantly and quietly. Should I be concerned, or only if it starts gurgling? I sure didn’t, until I opened up a half-empty tub of spackle to do a tiny bit of patchwork and discovered three different types of mold! I had an assortment of gray fuzz, orange splotches and black dots. I suppose since there’s some water in spackle, and it’s been humid, the little plastic tub provided the perfect breeding grounds for mold. Fortunately, I had some wood putty (without fungus!) handy that did the trick, and the trimwork around the new back door is one step closer to completion. Before sanding and staining the pine I bought for the new trim around the door, I peeled of the barcode stickers. I noticed something interesting. The pine was all imported from Sweden. Really? With the cost of energy, how much of the (relatively low) cost of the wood is absorbed by the cost of transporting the lumber across 4000+ miles of ocean and land? Don and I made a trip to pick up all the remaining pieces for the door: more caulk, more asphalt/tar/goop for the seal between the door and the driveway, lumber to rebuild the trim, paint for the door and other miscellaneous stuff. The old trim was in really bad shape. Bits of it had obviously been replaced over time, leading to an inconsistent and ugly mismash of wood types and stain shades. We measured the pieces we would need, then started to rip out the old stuff. The first bit came off easily – after we got through the four nails at the top, the rest was glued to the wall with liquid nails. Lazy. Then, strangely, we discovered two inches between the end of the drywall and the new door frame that had been filled in with wood. Apparently, the original door had been the standard 32″ width, and some previous owner had built up the frame to suit a 30″ door. It makes no sense whatsoever – why replace a standard door with an extra narrow one? Maybe he had an old 30″ one lying around? 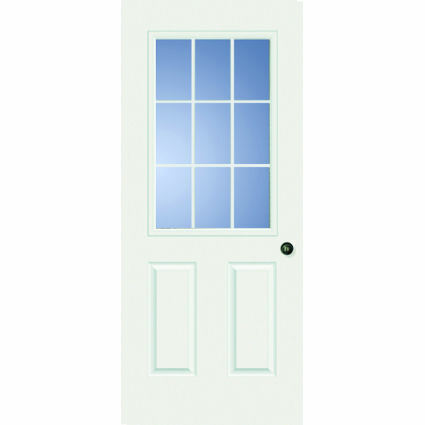 Regardless, even if I had known about the gap before ordering the door, I would have strongly hesitated going with a 32″ door, since it would have entailed cutting into the aluminum siding on the other side. Dimensions and list in hand, we asked for help in the lumber aisle at Home Depot. While Don picked through the 2x4s to find the straightest ones possible, the HD guy and I sought a sufficiently wide – and sturdy – piece to level out the new threshold with the existing cement steps. I said I was looking for a nice, thick piece of pressure-treated wood, but the HD guy kept trying to sell me some fancy, decorative piece. Finally, we found the millwork “expert” who suggested – what else – a thick piece of pressure-treated wood. They didn’t stock the width I needed, but they did have some a half inch wider. Sold. The HD guy proceeded to explain to me how I should measure the piece to the right width and – using a straight edge, dontcha know – mark the width, then sand it down. I agree that sanding is the way to go, and thanked him for his help. Then, upon returning to Don’s pile of 2x4s, the HD guy proceeded to repeat the recommendations for measuring, marking and sanding. Nevermind that he had just explained the exact same thing, 10 feet down the aisle, to me. Don was astounded by the guy’s demeanor – as if I was just the clueless helper on the project, and not the instigator! I told him that this happens ALL THE TIME with HD and Lowes associates. But alas. This afternoon, Don beat me home and started ripping out the rest of the trim. He made an interesting discovery – in the small, narrow space between the door frame and the corner of the house, the house is HOLLOW. No drywall, no insulation, nada. Just empty space, the framing of the house and a whole bunch of ants. So now we need to figure out what to do there. Is it worth drywalling a space that’s only 2″ wide? Either way, we’re going to seal the heck out of it and insulate it in some way, shape or form. Upon closer inspection, we discovered a small gap between the foundation and the siding – that’s gotta be the entry point for the ants. Much more to do, but progress is being made. And already, I feel so much more secure with a door that closes and locks firmly. Who names these things? How do we stop them? My lawnmower sharpening kit came with a great set of instructions that made the job pretty simple. Heck, each step was spelled out in three languages, and the diagrams actually made sense and mirrored my mower! I also learned a couple new words. Anyone know what this sentence means? Fortunately, the diagrams helped clarify the goal. 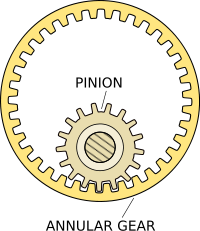 But what is a pinion gear, and how does it relate to a pawl? Who named these parts? And where do the names come from? Wiki comes to the rescue with a couple helpful definitions. A pinion is usually the smallest gear in a gear drive train. In many cases, such as remote controlled toys, the pinion is also the drive gear. But still – how to stop the madness of naming little bitty parts? It’s past time to replace my back door. The existing one is very, very old wood that has warped with age, and the glass leaks cold air and wind like a sieve. Plus, the existing storm/screen door doesn’t quite fit the opening. When I first moved in, there was a sizable – probably 4-5 inches – gap at the bottom through which Collette escaped one day. After that, I rehung the door so there were two inch gaps at the top and bottom. I never leave just the storm door open for any amount of time, since I don’t want to let bugs or critters in, but if I’m bringing in several trips – groceries, namely – and I don’t bother to close the actual door, I’ll see Collette’s face peeking out from the gap. I wanted to replace the doors last summer, but before I knew it, it was the height of mosquito season. I didn’t want to be doorless for an entire day with bugs streaming into the house. A couple weeks ago, I priced things out and called my dad, since he’s offered to use his know-how to install the new doors while teaching me how to do it. Saturday, he came over to take detailed measurements. My initial measurements had indicated that the door wasn’t a standard size, but I obviously wanted verification before I actually bought one – especially if it ended up being a special order. Dad confirmed my fears – the door I need is a 30″ by 80″ door to fit my 32.25″ by 82″ opening. We talked about enlarging the opening, but the framing around the opening is in really good shape, and we shouldn’t disturb it if we don’t really have to. Plus, with aluminum siding, we don’t want to create an opening that would then entail needing replacement siding. Ugh. Occam – keep it simple. So we went off to Menard’s, Mom and sister in tow. After finding the doors I had previously picked out, we looked at the specs. Yep, the size I needed would have to be special ordered. The Menard’s guy spent some time with his online catalog, adjusting options (kickplate? mail slot? what kind of hinges?) to come up with a quote. The door will likely run about $230 for a steel door with a half-light window with grills – essentially replacing the style already there. The corresponding storm/screen – with the retracting screen – will likely be more, closer to $270. The narrow size really limits my option. It appears – at Menard’s, at least, I’m limited to steel. While steel is definitely better than the ancient wood I currently have, it is prone to dings and dents, which worries me. This door is pretty high traffic, and though I may start off being careful, six months from now when I’m struggling in out of the cold with eight bags of groceries, I may end up doing some damage. It appears fiberglass is a bit more durable – and expensive – but I don’t even have that option. I’m going to further investigate my options at Lowe’s and Home Depot to see what else I can do. It just goes to show how home design has evolved. The back hallway part of my house isn’t original – it was added on at some point – but I’m sure 30″ was pretty standard for a door width then. Now, the standards seem to be 32″ or 36″. It’s like subway seats – as Americans have gotten larger, so have doors and seats – though airline seats have only shrunk. I have one even smaller door in the house. The door to my downstairs half bath – which I think used to be a pantry – is a paltry 24″ inches wide. It’s pretty claustrophobic in there.